National Polar Data Centre Spanish Polar Committee INFRAESTRUCTURA GEOCIENTÍFICA Y SERVICIOS Sistemas de Información Geocientífica National. 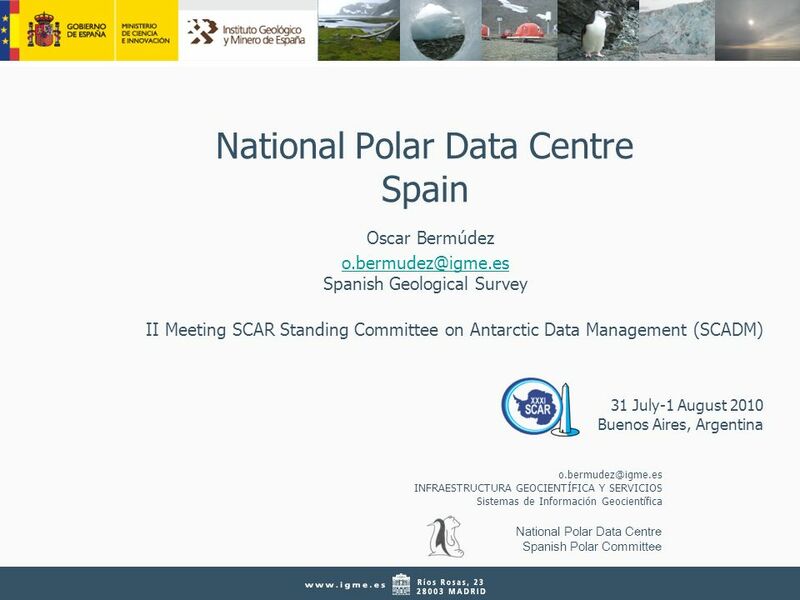 2 2 National Polar Data Centre Spanish Polar Committee The Spanish polar structure is something complex due principally to the lack of Antartic Institute. 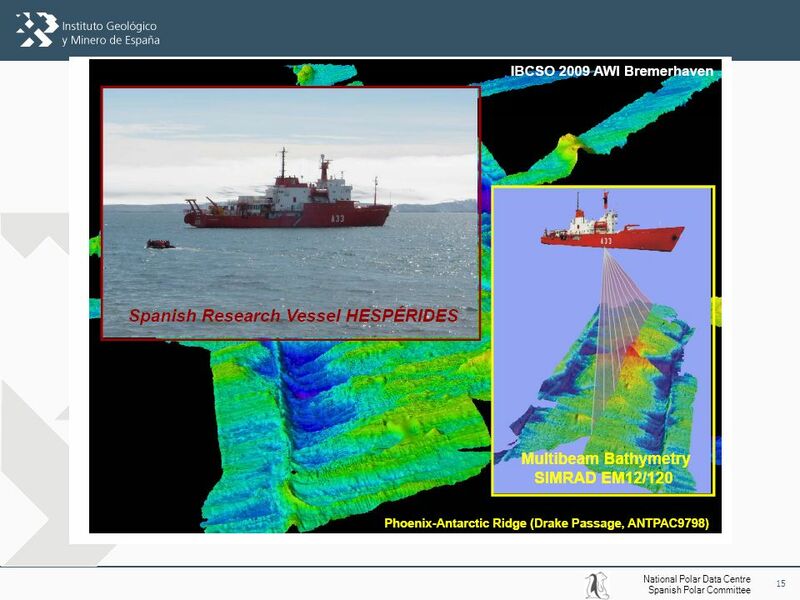 The Antarctic authority is settled in the Spanish Polar Committee, where it has been tried to include all the implicated parties. 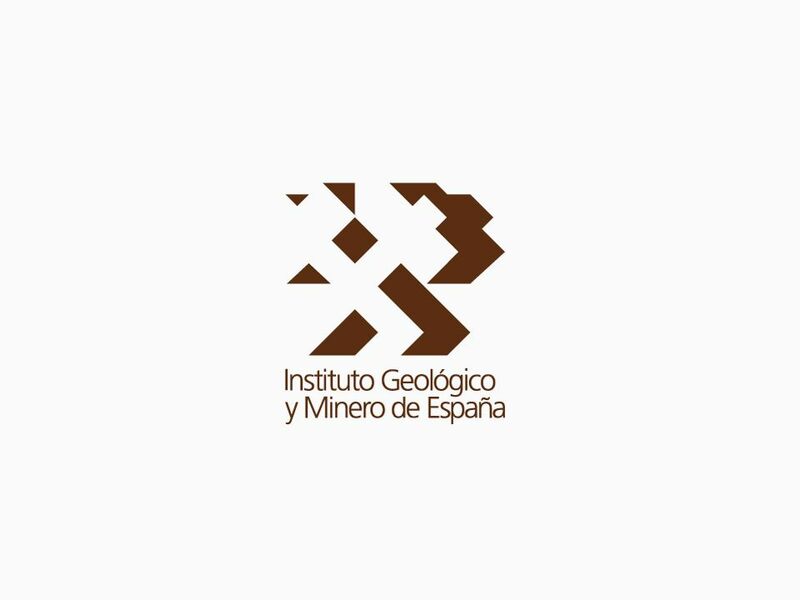 The technical secretary of the Spanish polar committee is in charge of coordinating the Spanish polar activities. 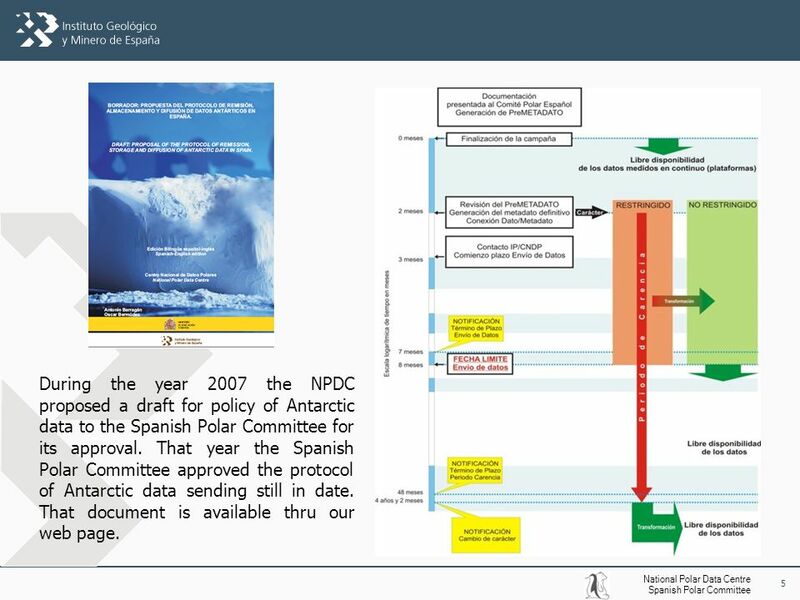 5 5 National Polar Data Centre Spanish Polar Committee During the year 2007 the NPDC proposed a draft for policy of Antarctic data to the Spanish Polar Committee for its approval. That year the Spanish Polar Committee approved the protocol of Antarctic data sending still in date. That document is available thru our web page. 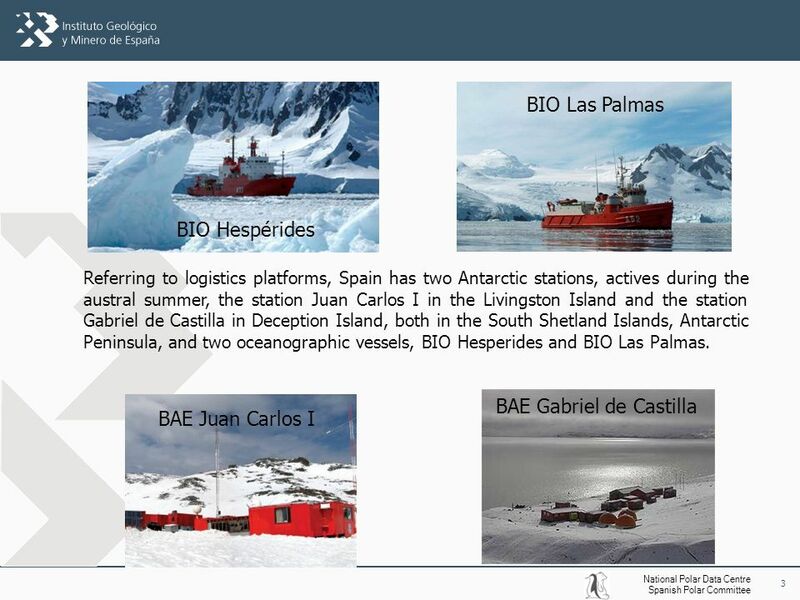 6 6 National Polar Data Centre Spanish Polar Committee The principal activity of NPDC is the creation of metadata of the Spanish investigation projects. 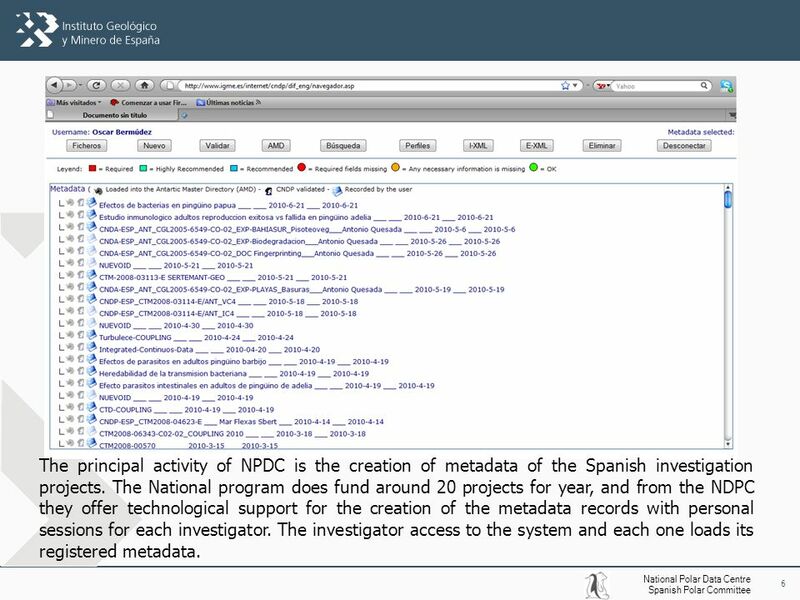 The National program does fund around 20 projects for year, and from the NDPC they offer technological support for the creation of the metadata records with personal sessions for each investigator. The investigator access to the system and each one loads its registered metadata. 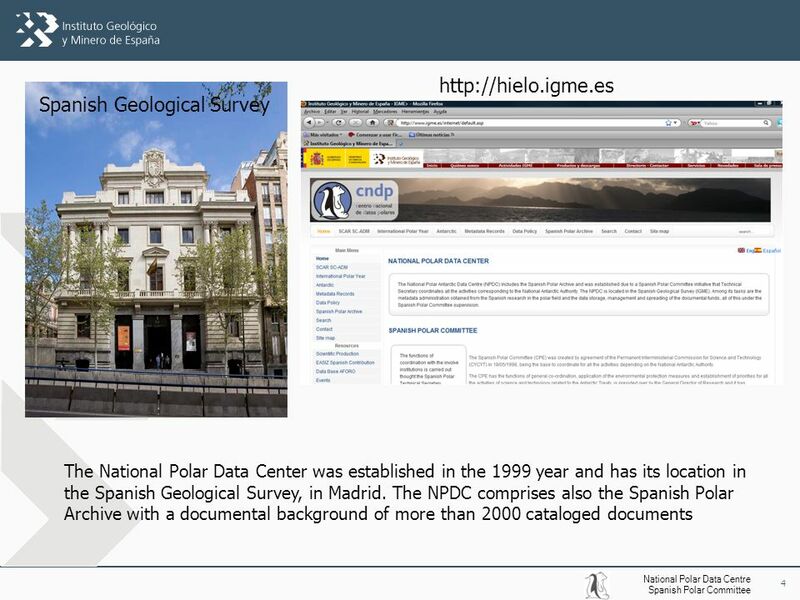 7 7 National Polar Data Centre Spanish Polar Committee Our tool is similar to the docbuilder but with IGME technology. That fact is also making a problem when the structure of DIF is modified so that we have to develop again our tool. 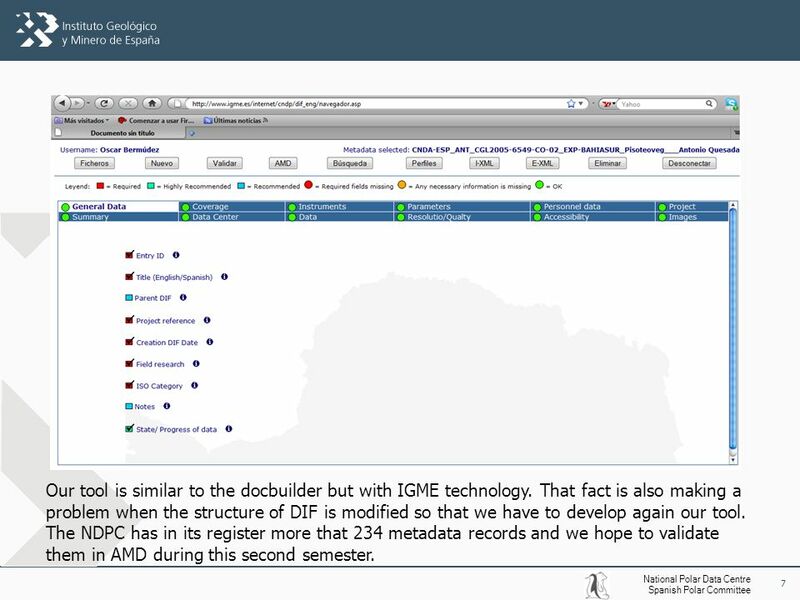 The NDPC has in its register more that 234 metadata records and we hope to validate them in AMD during this second semester. 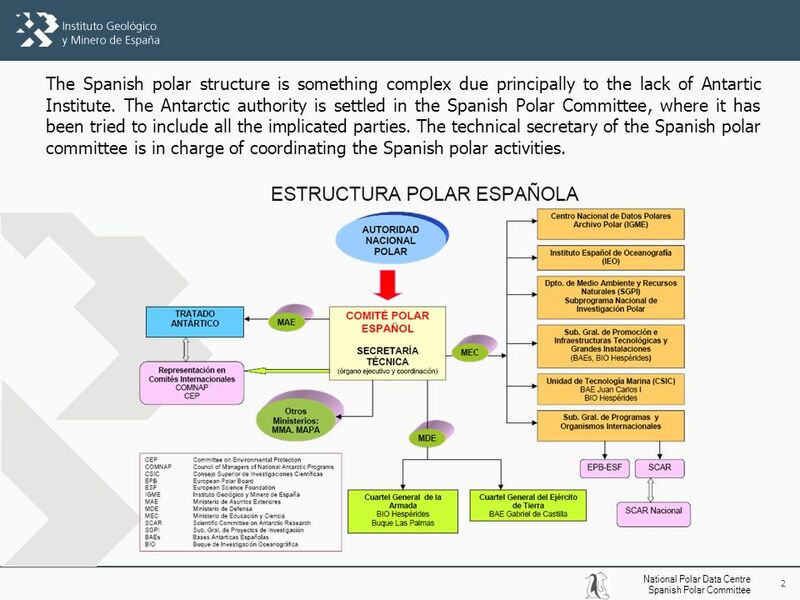 8 8 National Polar Data Centre Spanish Polar Committee As I mention before, the principal investigators from projects are the responsible of the metadata generation and the system is traced because the request of the National Program of Investigation. 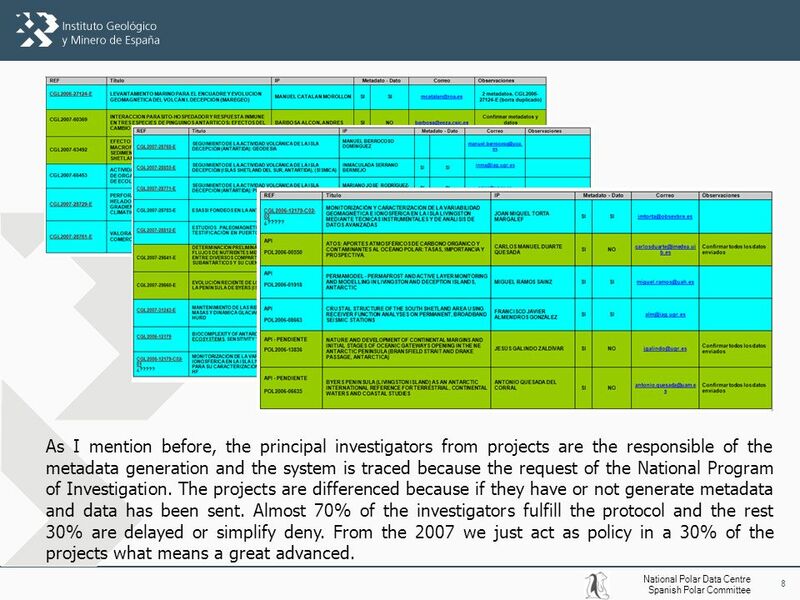 The projects are differenced because if they have or not generate metadata and data has been sent. Almost 70% of the investigators fulfill the protocol and the rest 30% are delayed or simplify deny. From the 2007 we just act as policy in a 30% of the projects what means a great advanced. 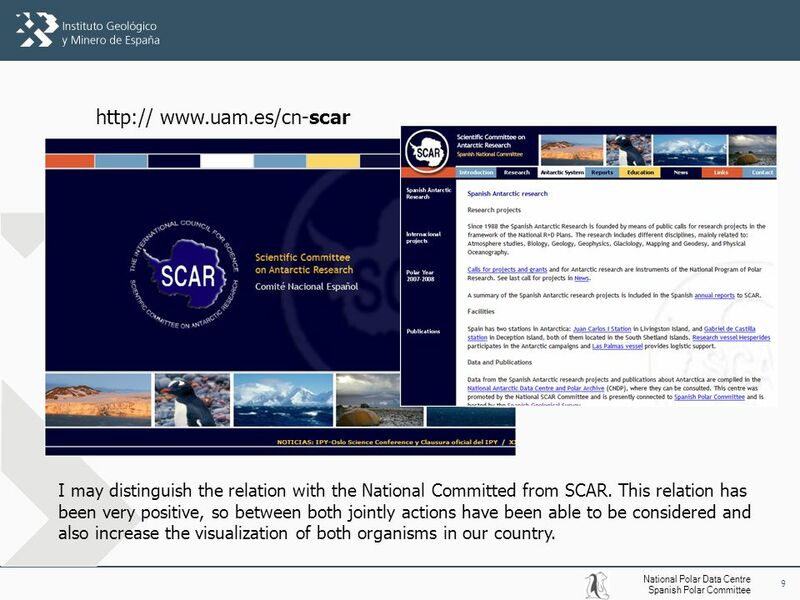 9 9 National Polar Data Centre Spanish Polar Committee http:// www.uam.es/cn-scar I may distinguish the relation with the National Committed from SCAR. This relation has been very positive, so between both jointly actions have been able to be considered and also increase the visualization of both organisms in our country. 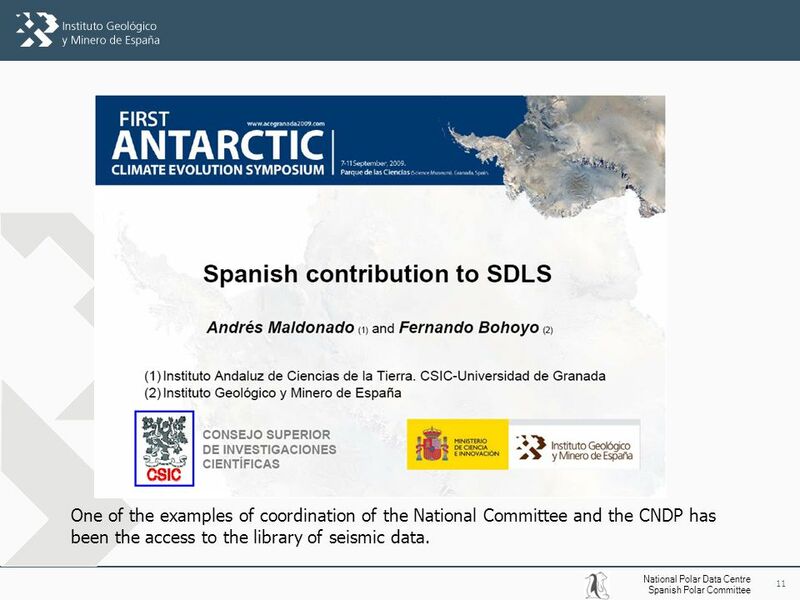 11 11 National Polar Data Centre Spanish Polar Committee One of the examples of coordination of the National Committee and the CNDP has been the access to the library of seismic data. 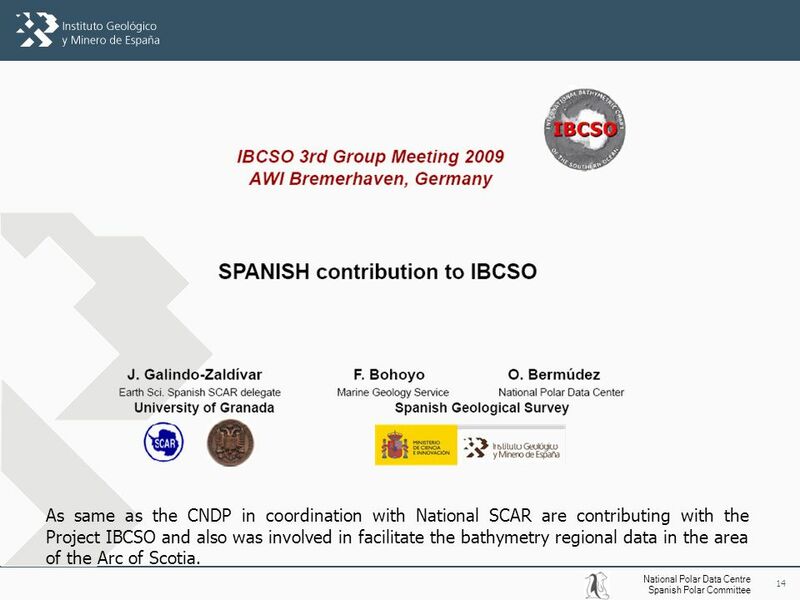 14 14 National Polar Data Centre Spanish Polar Committee As same as the CNDP in coordination with National SCAR are contributing with the Project IBCSO and also was involved in facilitate the bathymetry regional data in the area of the Arc of Scotia. 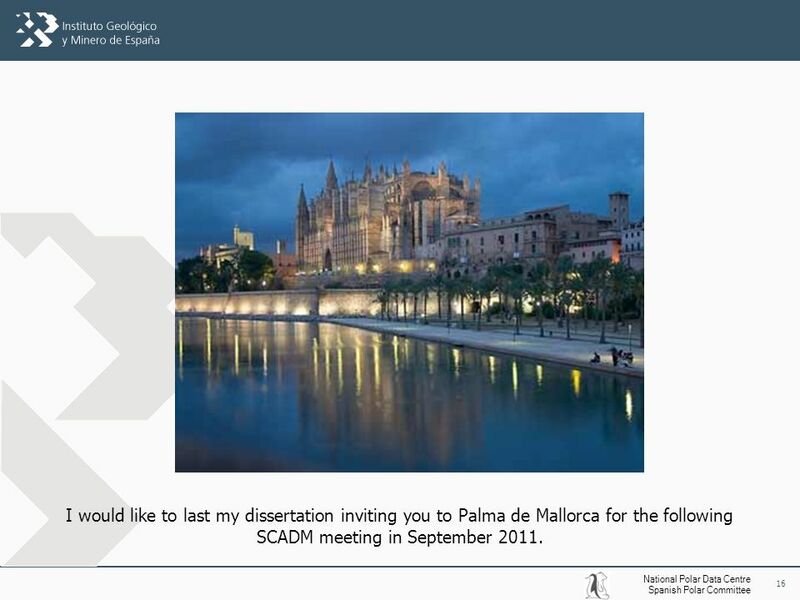 16 16 National Polar Data Centre Spanish Polar Committee I would like to last my dissertation inviting you to Palma de Mallorca for the following SCADM meeting in September 2011. 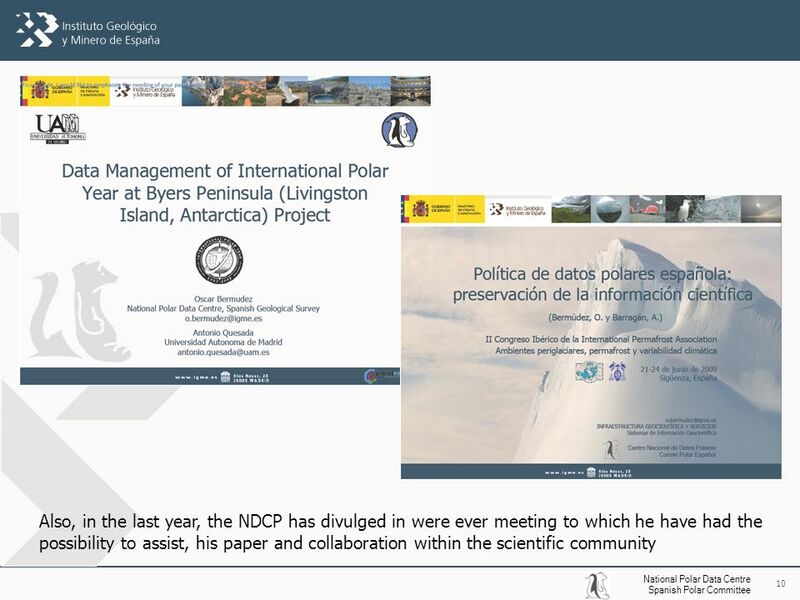 Download ppt "National Polar Data Centre Spanish Polar Committee INFRAESTRUCTURA GEOCIENTÍFICA Y SERVICIOS Sistemas de Información Geocientífica National." Slide 1 The missing link in the research cycle: AuthorAID at INASP Julie Walker, Publishing Support, INASP. 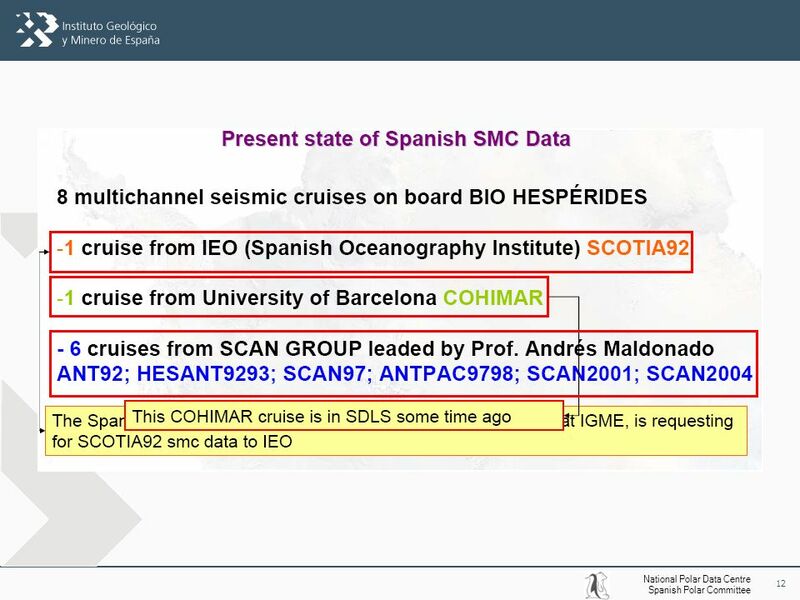 International Perspectives and New Developments in Antarctic Data Management Taco de Bruin Acting Chief Officer SCADM 8th Symposium on Polar Studies, Palma. SCAR DIMS Implementation 31st July 2010 Kim Finney (Manager, Australian Antarctic Data Centre & Chief Officer, SCAR Standing Committee on Antarctic Data. 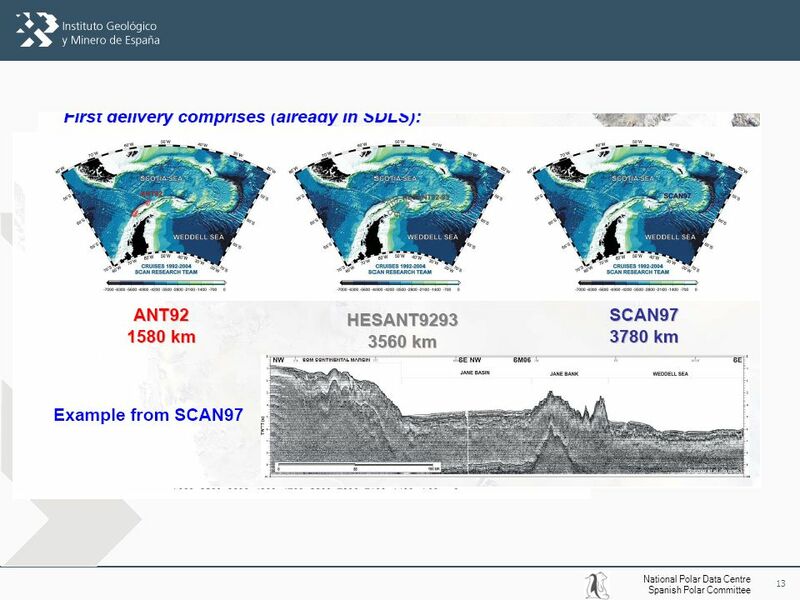 SCAR Standing Committee on Antarctic Data Management Establishing a National Antarctic Data Centre (NADC) Helen Campbell. Scientific Committee on Antarctic Research AMD User/Provider Survey Amsterdam 7 th September 2009. Argentinean National Antarctic Data Centre Diego Gómez Izquierdo SCDAM 3 Meeting Palma de Mallorca - Spain. The state of Antarctic data management; Japanese IPY experience Masaki Kanao, Akira Kadokura, Masaki Okada, Takashi Yamanouchi and Natsuo Sato National. Background photo: Sebastian Gerland, Norwegian Polar Institute SCADM 2011 Norwegian Report Stein Tronstad Norwegian Polar Institute. World Digital Library OSI | WEB SERVICES World Digital Library Arab Peninsula Regional Group Meeting Doha, Qatar, December 12-14, 2010 An Introduction. INSTITUTE for STATISTICS The International Standard Classification of Education ISCED 97. Primary research figuresPrimary research figures These are some of the results from my primary research. percentages of people who like/dislike the show.